You can use the Raspberry PI and the flashrom program to reflash Peavey Vypyr and Vypyr VIP amplifiers that have been bricked as a result of software updates gone bad. I recently worked with Ken Denaro who used flashrom on a PI to do the trick. For those of you who are unfamiliar with the Raspberry PI, it is a small single board computer that can easily fit in your pocket. The Raspberries were designed to give a low-cost experimenter’s platform to school kids in Britain at very affordable process. The computer by itself costs a whopping $35.00. Of course, you need a keyboard and probably a mouse as well as a monitor (a TV with HDMI works) and a case, but it is still quite affordable. To connect this to the memory chip in the Vypyr you will probably also want to get an SOIC clip to connect directly to the chip without having to unsolder/re-solder the extremely small pads of the memory chip. These clips can be found on the internet for less than $10.00 and can also be useful for re-flashing strange electronic things like bricked computers. This is actually a lot more straight forward than the approach that I demonstrate in my “Resurecting a Dead Vypyr” video where I use an Arduino Uno and flashrom. The Arduino has some other capabilities that make it the right answer for me. For example, the Arduino can act as an SPI slave or an SPI master which allows it to function as either a Vypyr decoder board – the part with the knobs, switches, and lights (slave mode) to control a Vypyr or to drive a Vypyr encoder board (master mode). Hi Glen, my Vypyr Tube 60 recently gave up the ghost, it’s not giving me any test lights on the front when I power it on and I’ve checked and found that it’s supplying power to the DSP board. 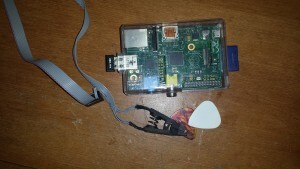 I would like to try out flashing the firmware to it using a Raspberry Pi to see if that will fix the problem. Do you still have a copy of the Vypyr rom available that you can send me? Dear Glen – I will shortly by trying to re-do your success with re-flashing using a Raspberry PI. If you have any tips-advice to share and potentially also a copy of the Vypyr ROM in flashrom format. The amp is a 30 W Peavey Vypyr. With the VIP 1 is U2 still the same chip as per the tutorial, the chip type is 25PE40V6 8 pin chip. Same chip. It is a bit more difficult to access on the board though. The VIP lives! The only issue I had was getting a solid connection with the clip – took a couple of goes before the write worked. The latest stable version of flashrom (0.9.9) needed libusb-1.0-0-dev on the PI (the flashrom webpage indicates libusb-dev – ‘make’ fails on the headers with this) and raspi-config needs SPI changing to yes. If I were doing it again I would add some protection for the GPIO pins into the circuit. I’d also use a GPIO breakout rather than using the PI’s GPIO pins directly which just invites a mistake. The Raspberry PI is a fantastic bit of kit! Many thanks for your help with this. At some point I will add an update to the Peavey forum so others know it can be done. Glen. I f#C*king love you! Sorry for the language. Once I did my due diligence I figured out the problem. The serprog dev team has been making the switch from serprog-duino to frser-duino for using an UNO as a programmer, so things got a little wonky with the baud rates. My main problem was absolutely a linux issue on my part, though. I didn’t add myself to the dialout group so it kept losing permissions to use the ACM0 port in the middle of flashing. It took about 3 hours of failed attempts and a couple bruises to the head, but when I finally figured out the issue it was all so clear. Long story short, it worked and I could not be more grateful! I will for sure be buying music from one of your friends as a thank you. I hope I can be as helpful to someone else as you have been to me. You have no idea how much being able to play music means to me, and you have given me back that gift. Thank you so much.